The last leg of our Chinese New Year vacation was in Cambodia. We spent a few days using Siem Reap as a base from which to explore the temples of Angkor, and then took a bus down to Phnom Penh, where we flew home from. Siem Reap and the temples of Angkor, Feburary 13-15 We rented some old bicycles in Siem Reap and used them to explore the town and the nearby temples of Angkor. The temples were amazing, and we hardly even scratched the surface over two days. On our first day, we completed the small circuit (17 km + 12km to/from our hotel). 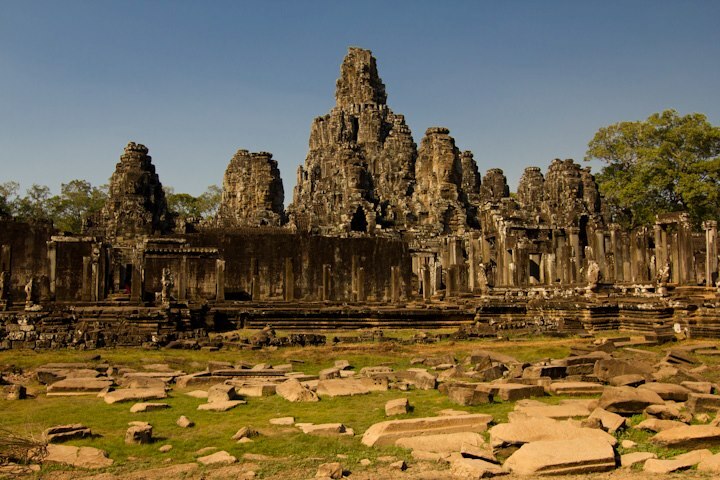 We expended most of our energy on exploring Angkor Wat, the Bayon and Ta Phrom, although we stopped at many of the smaller temples along the way as well. The faces of the Bayon. 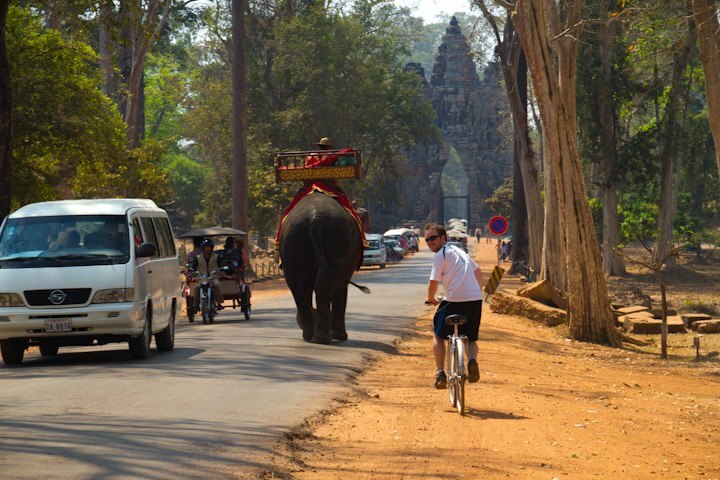 We took advantage of the morning lull to return to Angkor Thom and explore Baphuon and the Elephant and Leper King Terraces as well as the other structures in the area before heading out to ride some of the big circuit. Mike took an amazing shot from the top of Baphuon, which I was happy to see. You see, although the dress code of covered knees and covered shoulders is waived at Angkor Wat, this is not true for the entire Angkor complex. The dress code is enforced at the Baphuon, and the guard at the temple entrance deemed my soccer shorts too short. Mike went in to explore, while I walked around the perimeter and then took a rest in the shade, where I watched dozens of other women and men being turned away as well. My advice for other travelers would be to keep a sarong handy for situations such as this. The view from the top of Baphuon. We lasted into the early afternoon, and then, starving and hot, decided to bike back to town to plan the remainder of our trip. 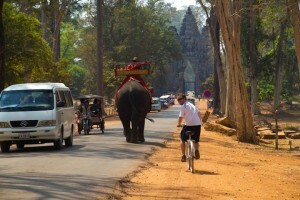 Mike riding next to an elephant outside the gates of Angkor Thom. By the time we had everything worked out, we were running out of daylight! We debated about returning to see sunset from one of the temples, but decided to spend our last evening exploring Siem Reap instead. We hopped on the bikes one last time and visited Wat Bo, one of the province’s oldest pagodas, and then rode down the river back to town. Our time exploring Angkor was amazing, and it brought back many memories of visiting Chichen Itza on a school trip with my brother many years ago. There’s something really awe inspiring about such vast cities now abandoned. Even weirder is the knowledge that although old, the structures at Angkor are not really that old. 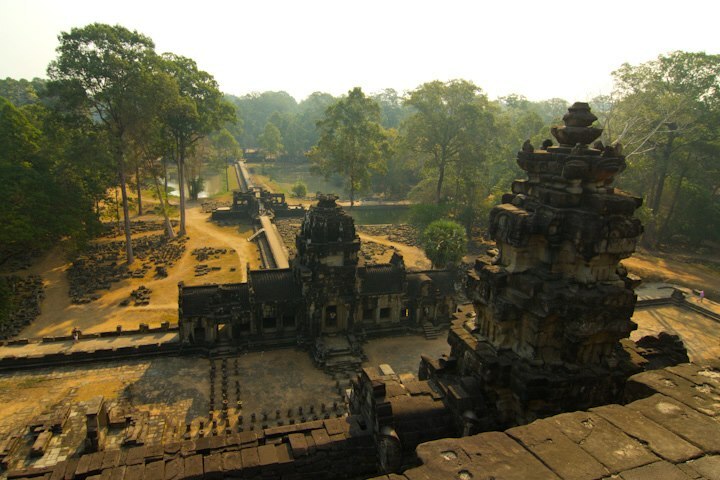 For example, the Mangalartha in Angkor Thom was dedicated in 1295, but there isn’t much left of it now. It is truly amazing how quickly nature can take things back. Travel day, February 16 In the evening on the 15th, we were considering spending one more day in Siem Reap. Sadly, yet again there were no hotel rooms to be had to extend our stay. Additionally, the best bus service to Phnom Penh was fully booked, again for 2 weeks. The helpful clerk at our hostel booked us onto the next best thing, a $7 “VIP” bus. The ~300 km journey takes about 6 hours. “Don’t worry, it is nice and there is a bathroom on this bus too.” The clerk told us. We were skeptical, but didn’t have much choice. Cambodian buses are notoriously unsafe – only the best service was crash free last year. We paid our $14 and I hoped we would make it through. On the 16th, we woke up and had breakfast at the hostel while we waited for our free shuttle to the bus terminal. As we expected, the shuttle, a rickety old minibus already packed with tourists and their backpacks, arrived about a half hour late. We climbed on, and then the shuttle drove to one last hostel to pick up 5 French girls and their gigantic backpacks. Unfortunately for them, there were only 4 seats, so two of the girls had to share. Shortly after picking them up, a shockingly loud BOOM was emitted from the back of the bus, stirring up all kinds of dust in its wake. Even the bus driver thought it was abnormal – he parked the bus and got out to check the tires while we laughed nervously inside. “No problem, just a backfire!” and we were on our way. We finally got to the bus station, and as we expected, the bus was like the ones we took in China: seats close together and no bathroom in sight. However, given the number of stops on our previous journeys, that is no real problem. The population on the bus was half foreigners and half local. We made about 10 stops to get and drop off passengers and packages, and two longer rest stops. At one, there was a lady selling all kinds of bugs, including tarantulas, for snacking. We made the journey in just about 7 hours, and honestly, we couldn’t go much faster than we did. The narrow road has only one lane in each direction and much of it is taken up by cows, cyclists, and other buses trying to pass them. Given the bus safety record, I’m glad we went a bit slower and made it to Phnom Penh in one piece. That being said, the opportunity to see a bit more of Cambodia, even if it was just flying by the windows, was very nice. 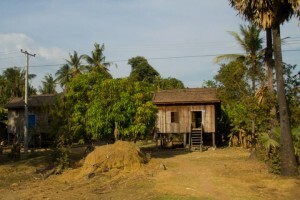 The countryside was surprisingly bare, and we got a good look at a lot of poverty. Cambodians definitely have a hard life. A typical house as seen from our bus. Our hotel was just a short walk away from the bus terminal and was easy to find. The only catch: it was on a street full of hostess bars! It turned out to be fine, but it was a little funny to see 4 packs of viagra being sold over the counter at the convenience store across the street. The theme for our first day in Phnom Penh was markets. We got breakfast on the waterfront and then walked past the Royal Palace on the way to the Russian Market. The Russian Market was pretty cool! In addition to the touristy areas where I picked up a scarf and some tiny hand-woven baskets with black pepper kernels inside, there was also a wet market and a huge area full of tools and scooter parts. It was refreshing to see a market that is for the locals too, because we didn’t manage to get outside the tourist bubble in Siem Reap. Then we grabbed lunch at a cool place called Cafe Yeji, which is partnered with NGOs and employs underprivileged youths and women. I liked that a lot, because we could be pretty confident that our patronage was directly benefiting the people working there. Next we walked to the Central Market, which focuses more on watches and jewellery. Finally, we walked to the old market near our hotel, where we bought some mangosteens (yum!). For dinner, we found the Green Vespa, a British pub, where we had a delicious Sunday dinner roast and some red wine. I can’t even remember the last meal I had like that. We had a few beers at a few other patios and then called it a night. On our last day, we had originally planned to visit the Palace and the Silver Temple, however, the Palace grounds were closed due to the death of the king. So instead, we visited Wat Phnom and then tracked down a couple of bike stores to see what the price range and variety was like in Cambodia. The park at Wat Phnom was lovely, and we spent some time just sitting near the temple, listening to the music that was coming from it. We also watched a little boy successfully get a busload of tourists to pay him $10 USD to release about a dozen birds from a cage he had. It was a little bit funny, because, as you might expect, he just collected the birds again a little while after they left. After some bike shop window-shopping we chose a nice place on the waterfront to have one last Khmer dinner. All in all, it was nice to have a relaxing day, because we were going right back to school when we returned to Taiwan! Our flight on Tuesday went smoothly and we were home in time for dinner. The best part was using the e-immigration terminals in Taiwan, rather than having to wait in line to talk to an official! Final Thoughts I want to highlight something interesting about Cambodia that doesn’t really fit into my travelogue above. 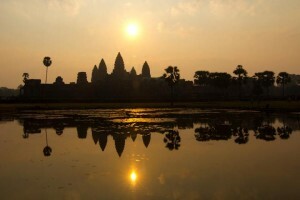 Cambodia uses a dual economy – prices are given in USD and Cambodian riel. However, due to the low value of the riel, the currency in common use is the USD. A number of people told me that when you pay for something using USD, Cambodians will try to give you riel back as change. This was generally communicated in a negative way, implying you will be stuck with a lot of worthless currency, which, I must admit, stressed me out a bit. However, this really isn’t the case. 4000 riel is equivalent to 1 USD, and there is no American change in circulation. Instead, the Cambodian riel is used to make up the subunits of a dollar. So, for example, if something costs $2.50 and you pay with $3USD you will get 2000 riel back. We also commonly paid for things like bottles of water with riel, when we had enough of it and not enough small American bills. As an overall impression, being in Cambodia was surprisingly a lot like our visit to Cuba many years ago. Everywhere we went we drew a lot of attention from locals who wanted us to buy things or services from them. It is a difficult place to be, because of the sheer number of times you are approached during a day. The hardest part is being approached by small children during the week when they should be in school. More often than not, the parents are nearby and picking out the people the kids are supposed to approach. If you want to help out locals, there are a number of businesses that ensure their employees are given good opportunities and paid fairly. Places like the Cafe Yeji, and Seeing Hands (a massage parlour staffed by blind persons) are good places to start while you are there. We talked to a few locals during our time in Phnom Penh, and they were hardworking and optimistic about their futures. Meeting them was refreshing, because for a little while it looked like we would be unable to talk to people without the expectation of payment. Our time in Cambodia was a real reminder about how incredibly fortunate we are to be Canadian, and how important it is to make the most of it! This entry was tagged Angkor, Asia, Cambodia, Phnom Penh, travel. Bookmark the permalink.